Well into the second century of the automobile, new vehicles can't help but be a portmanteau of earlier designs. Even those that believe they're a new segment. 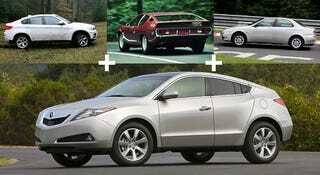 Let’s see some of the recently-revealed Acura ZDX’s forefathers. Gandini’s solution is an elegant way to increase rear visibility in a profile which tends to reduce it. The 156, one of the greatest sports sedans ever made, is a 1997 design by Walter de’Silva, currently head of design at the Volkswagen Group.